The Spaceman's still going, man. 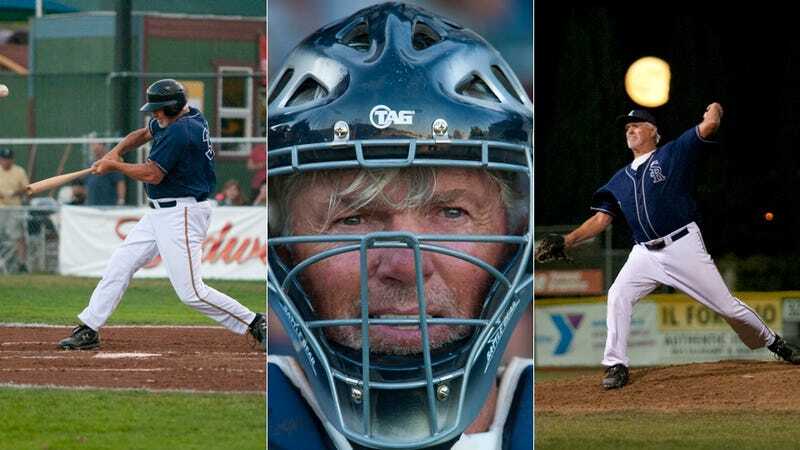 Baseball's most famous old hippie again made a couple of appearances with the independent San Rafael (Calif.) Pacifics this week, nearly one year to the day after he tossed a complete game for them at the age of 65. Far out. Like his other minor-league adventures in recent years, Lee got into these games as a publicity stunt. But all the years of booze and drugs haven't completely robbed him of his skill, even now. Lee can still play a little. Lee, who last played in the bigs in 1982, batted in the 9-hole for the Pacifics Tuesday night. In his 14-year MLB career, which included six seasons in the AL after the DH was instituted, Lee batted .208/.212/.264. Tuesday, he went 2-for-4 with an RBI in a 5-3 win over Maui Na Koa Ikaika. And last night, against the same team, during what was appropriately Senior Citizen Night, Lee bounced around and played a different position in every inning. He started at catcher in the first—recording an assist, but also yielding a stolen base and a pair of passed balls—and then spent the next three innings at all three outfield positions before pitching and playing both spots on the left and right sides of the infield. In the eighth inning, while paying second base, there was a ground ball Lee couldn't get to that allowed a run to score. Otherwise, nothing was really hit his way. At the plate, Lee went 0-for-3. In the bottom of the ninth, with the Pacifics trailing 4-1 and Lee due up with the bases loaded and two outs, manager Ryan Priddy chose to pinch-hit for him with Maikel Jova, the reigning league MVP. The crowd reaction was mixed—some chanted "We want Bill! "—and Jova struck out to end the game. The Pacifics are in first place by 10.5 games in the five-team Pacific Association—what's left of the North American League, which folded after last season—heading into this weekend's championship tournament. But The Spaceman won't be there. He's done for this year. He'll probably just spend the weekend drinking beer and getting high.